Livy, a data science startup, needed user research, concept validation, and design for a mobile event recommendation app. Because Livy will leverage AI and machine learning to provide personalized event recommendations, we also looked at other personalized recommendation services. We wanted to know how these apps onboard users and present recommendations. Next we wanted to understand the capabilities and constraints of machine learning and artificial intelligence. We felt it was necessary to have technical perspective if we wanted to maximize the user experience. We interviewed two data scientists and a designer who works with machine learning platforms. Those conversations, combined with reading and online courses, gave us a solid understanding of Livy's technical environment. We interviewed ten regular event goers in the Chicago metro area. 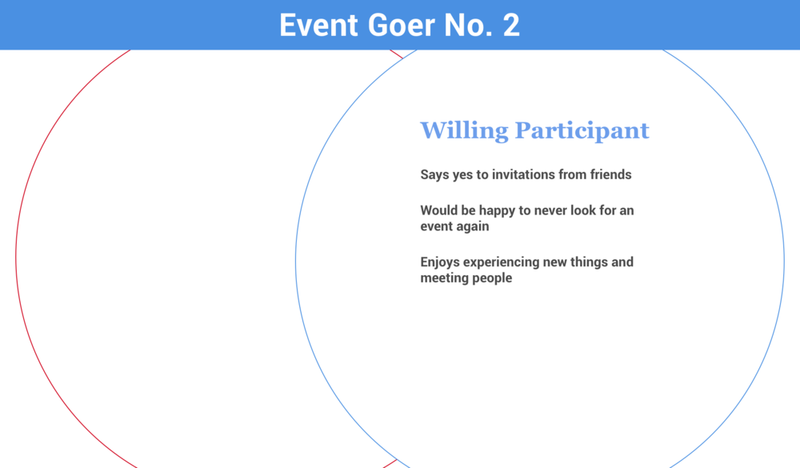 We wanted to find out about their motivations for attending events and their process for discovering and evaluating the events they attend. Actively searching for events was something people felt strongly about. Livy assumed that users would be attracted to an app powered by artificial intelligence. So we also explored participant worldviews of AI and machine learning. Participants appreciated recommendations like the ones Netflix provides. But they were not entirely comfortable with the idea that machine learning powers those recommendations. Who is the Livy user? With hours of interview transcripts we needed a method to organize the data. We started with affinity mapping. It was clear that there are two distinct types of event goers: Avid Event Seekers and Willing Participants. View the slide gallery below to see these two proto personas–and their overlapping goals, motivations, needs, and pain points. 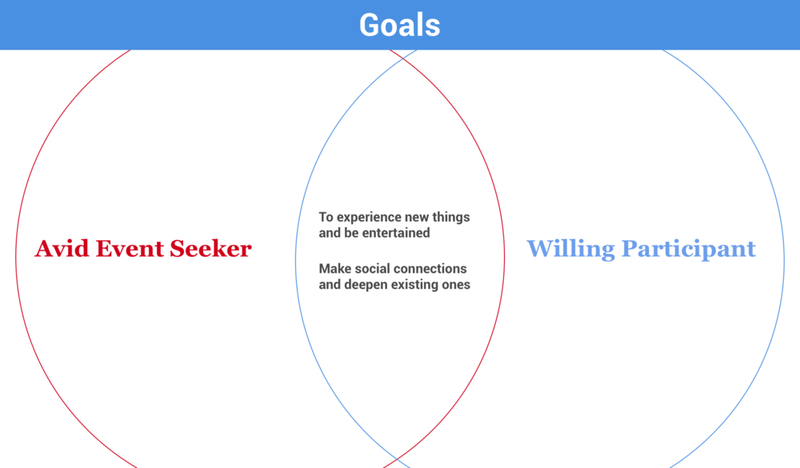 From the Venn diagrams we could easily see how designing for the Avid Event Seeker would provide Livy with a clear value proposition and audience. 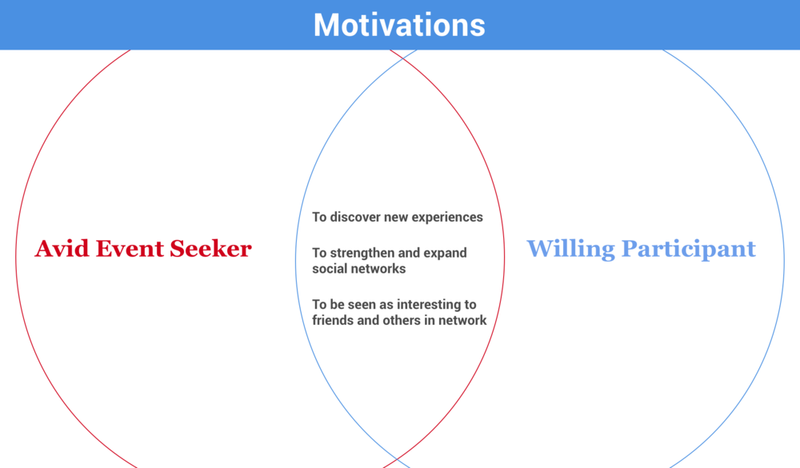 Next we created a mental model for the Avid Event Seeker. The model involved pre, during, and post event considerations and behaviors. This mental model shows the Avid Event Seeker's process from discovering an event to evaluating how it went. Next, we layed out the specific journey of the Avid Event Seeker. The journey map reinforced many of the points in the mental model. It also clarified the micro routines involved in finding and attending an event. Synthesizing our research helped clarify our opportunities. But before we started sketching and concept testing we developed a couple of touchstones to guide our design process: a design opportunity statement and design principles. Livy understands that users’ priorities change and makes it easy for users to find what they’re looking for, no matter what that is. Livy embraces user feedback and available data to tailor recommendations without needlessly limiting the user’s sphere of opportunity for new experiences. The user has insight into why events are chosen and an opportunity to weigh in on the success of those choices. Livy leverages feedback, incentives, and social connection to give users more for the time and energy they spend filling their schedule with the next great event. Livy knows that sometimes users hit the town solo, but more often than not they’re looking for a "plus one." With Livy it's easy to connect the dots between what you’re going to do and who you’re going to do it with. Our initial prototype needed to address onboarding, presenting recommendations, event details, sharing events, and incentives for user feedback on recommendations. We did eight rounds of rapid sketches for each user flow. When done we had a wide range of approaches on paper. We reviewed them together and chose the strongest directions to test. Then we each built a low fidelity prototype for concept testing. Each concept test session involved a moderator and a note taker. Our five testers, all regular event goers in Chicago, completed a series of tasks while speaking their thoughts and actions aloud. 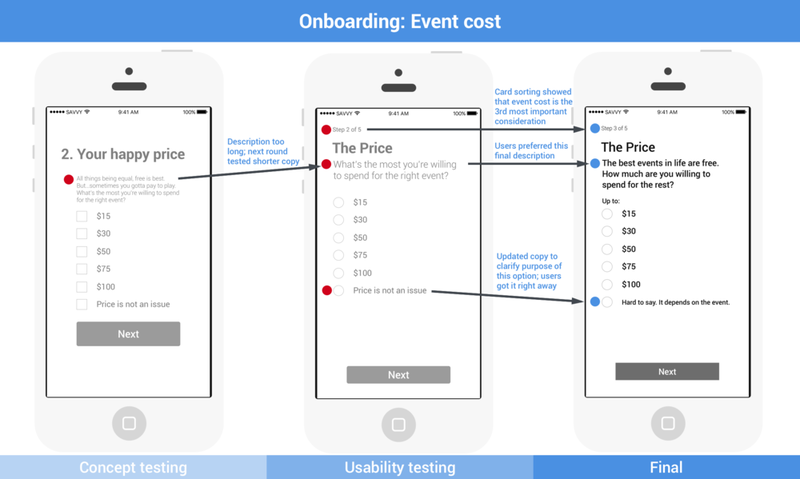 Two of the onboarding sequences we tested utilized the user input approach. One used a Facebook only sign up. Even users who expressed interest in signing up with Facebook also wanted to share input directly to the app during onboarding. Because we had two versions of the user input approach we were able to get data on UI patterns even during concept testing. I was responsible for integrating onboarding feedback. View the gallery below, which features my initial concept screens and subsequent iterations, to see how onboarding evolved through two rounds of testing. What do users think of assigning a monetary value to their feedback? What do users value most in return for their feedback? As a team we assessed the user feedback and it's implications for the incentives. We decided that rewards could increase user engagement and loyalty. And we agreed that some major changes needed to be made to accomplish that goal. I was responsible for iterating on this aspect of our prototype. You can see the changes in the final prototype in the next section. We tested two approaches to the dashboard. One was a tinder-style interface where users swiped left or right as they were presented with one recommendation at a time. The second approach used a swimlane pattern that gave users the ability to browse and explore from a selection of curated events. Users preferred the swimlane pattern. During our second round of testing we sought to understand what categories users wanted and how they wanted the information presented. You can see the refined dashboard in the final prototype. In this case study I've reviewed the user flows I was most responsible for: onboarding and rewards. These show how our collaborative process led to a user experience design grounded in both user insight and technical requirements. Our final prototype was a mix of screens created by each designer on our team of three. Click on the Create Account screen below to view the Invision prototype of the final onboarding flow. This collaboration was especially rewarding. We collaborated as a design team of three UX designers, an art director, and a project manager. We also worked closely with Livy's founder. As a data scientist he had a lot to share with us about Livy's technical vision and environment. And he was eager to learn everything we could share with him about the user. This project also reinforced the difference between conceptual and visual fidelity. Visual fidelity in the form of well thought out patterns, spacing, typography, and key iconography can help communicate the concept to user testers. However, visual fidelity in the form of color and images can distract users from the concept and focus their attention on content-specific elements. As a designer I'll continue to be mindful of the objectives for testing when deciding how much visual fidelity is required to facilitate those objectives. I also learned that even when your client is an expert in the project subject matter, getting perspective from additional experts is invaluable. I learned to notice the shift in energy that happens right around the time I could really use a critique on my work. If I lose focus on the 20% of my work that will be responsible for 80% of its impact, it's time to get feedback.